Rennicks UK’s Virtual Journey Time technology has proved ‘invaluable’ on a major road maintenance project, according to a contractor on the scheme. East Sussex Highways, a joint venture between Jacobs and Costain to deliver an end to end highways service for East Sussex County Council, asked Rennicks to deploy its Virtual Journey Time System (RVJTS) on remedial works on the A22, a strategic route running through the county. The pavement structure on the A22 London Road, East Sussex, showed signs of an underlying problem within the subbase layer/subgrade. A decision was taken to reconstruct the pavement using the insitu-recycling process, which required a night road closure for the works to be completed, with a diversion of approximately 20 miles. With the reconstruction works taking place on a road that sees an estimated 20,000 vehicle movements per day, it was important to communicate effectively with road users so they were aware of the impact the diversions would have on their journey. The RVJTS makes use of crowd-sourced journey time data to provide live, accurate information to road users to help improve the experience for motorists and minimise disruption. Two months prior to the start of the works, East Sussex Highways used it to monitor existing traffic flows. This provided a clearer understanding of the route and the impact the diversions would have on journey time for the motorists. 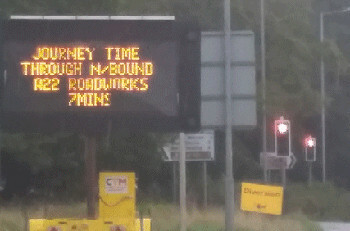 Using an Advantage 4280 mobile Variable Message Sign (VMS) that could be programmed remotely, East Sussex Highways could display live, accurate journey time messages that were easily read from a distance by oncoming traffic. The position of the VMS units allowed drivers to use this information and seek alternative routes. Rennicks said it also helped East Sussex CC to identify significant savings on the traffic management of this project and reduce the amount of complaints received from the general public.